First things first: our name. Why did we pick it? Honestly, “The Wandering Fools” just sounded like a fun name. So we ran with it. Is there truth to the “fools” part? Quite possibly – though we do our best not to deserve the title. Our goal is to share our experiences as we travel to as many unique and exciting places as we can. I grew up in a small borough in The Middle of Nowhere, Pennsylvania, where I was homeschooled and let loose to explore the vast surrounding forest and countryside. Once old enough to leave the nest, I set out for a career in the fast-paced world of graphic design. That life phase lasted a short two years before I realized it was not my dream job. So, I opted to pursue higher education in Florida (I know: “education” and “Florida” just don’t go together). After earning a BFA, I traveled across the country to Sony Imageworks in Los Angeles. There, I worked on feature films ranging from animated kids’ movies to live-action blockbusters. I then spent a few years hopping amongst studios in Sydney, Vancouver, and New York before returning to the greater LA area to work at Disney Animation Studios. My job funds my passion for traveling, and my location is perfect for outdoor sports. 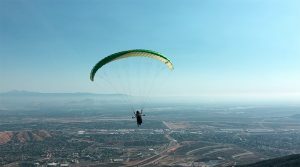 I am an accomplished paraglider and recently became tandem certified, so I am able to share the experience of flying with others. When I am not flying, I canyoneer and rock climb in the many local canyons and mountains. My love of travel and outdoor sports didn’t strike until my college years. Bookish and shy, I led a largely suburban-centric lifestyle in Southern California. But a senior-year backpacking trip with friends gave me the courage to experiment with activities beyond my comfort zone. 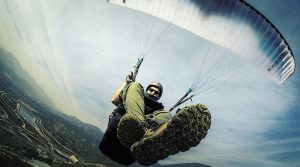 Solo trips abroad and across the country were followed by rock climbing lessons, paragliding instruction, canyoneering training, and camping trips with new friends who shared my interests. It was on one of these trips that Mr. Fool and I met. Where have we been? Where do we have left to go?